The slow destruction of an Ouya Controller after 1 year of moderate use. I don’t think I would consider myself an aggressive gamer to really abuse the Ouya Controller. I have a total of 63 games loaded on my Ouya with over half of them being side-loaded emulators coupled with all of the things I learned in previous blogs about this consoles journey. Multiple times I have re-rooted this Ouya and even had to firmware reset it a few times as well. Though out all of this the controller is the real item that takes the beating in any game console. I know some of this will view my blog as being nitpicky however there are people who want to take care of their consoles and treat them with a fair amount of respect so that it can last a very long time. Read on if you want to know more or just want to take notes if you are buying a used Ouya Controller on the used market. We start off with general plastic wear. Since I do a lot of side-loading and browsing (which is probably what you are doing right now on your Ouya) the first thing that tends to get worn-looking is the mouse-pad. The pad becomes smooth-looking and shiny but only in the center of the pad. The back of the Ouya Controller will get shiny as well around the grips where your palms would be rubbing against it as well as scuff-marks from either dropping or resting it on the table. Some Hair-line scratches start to appear on the action buttons and shoulder however unless you are shining a direct light it is unlikely you will see that. I am not an engineer. But you may want to re-think metal rubbing against plastic. This is the picture of my new Ouya controller and my old Ouya controller both without their metal plates on to get a better picture of the torn up part. 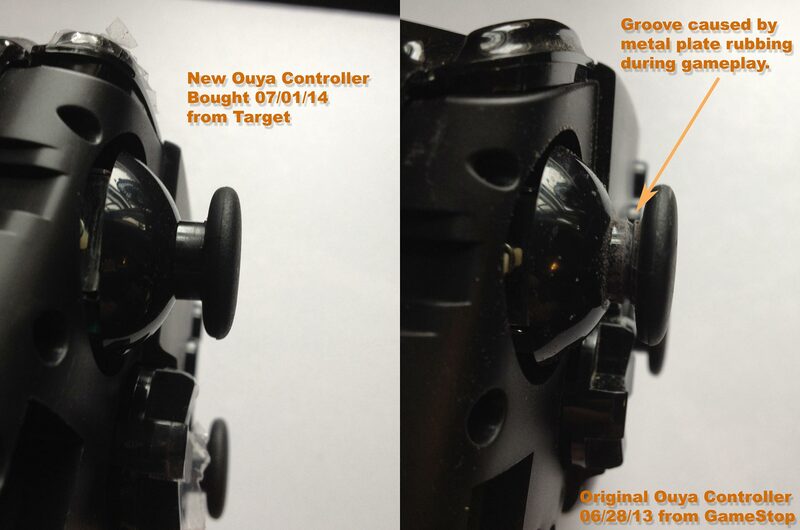 Where the damage really begins to take hold on an Ouya controller is the sides of the analog thumb-sticks. That by using metal for your controllers as a way to ensure your customers that the joystick is sturdy and reliable it begins to dig into the stem of the analog pad. This type of wear could eventually lead to the pad breaking completely off. The picture above is a side-by-side comparison of what the controller should look like and what mine looks like after a years worth of average usage. You can remove the analog thumb-sticks by removing the plates and with slow and even force pull the controller up towards you. It will eventually pop out and from there you can replace them with Xbox360 aftermarket analog hats as they are the same height and diameter that go into these controllers. (It may even possibly feel better because Xbox analog sticks are concave to give better support to your thumb) removing the right analog thumb takes a little more to disassemble then the left. You can always get replacement metal plates to get that new feeling in the front. 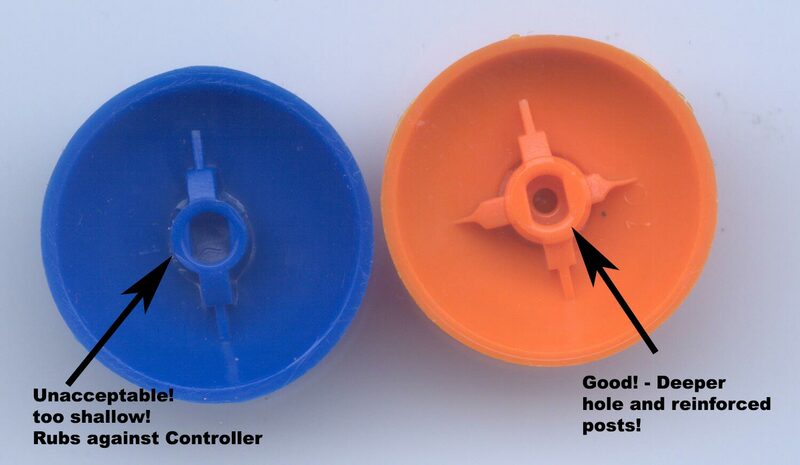 The good news is the mounting posts for the analog controllers are xbox360 compliant in both the radius of the hat as well as the overall height of the hats. I did find that replacing my Ouya controller with Xbox 360 hats actually got rid of a lot of the mashmellow effect that I used to have with a stock controller hat. Although I should give a word of caution for anyone buying Xbox 360 hats especially from China which is there’s a lot of different ways these hats are molded. The blue on on the left in the picture above did not fit the Ouya analog stick and upon installing the metal plate the hat would stick and start scraping against the metal along its base! It was totally Unacceptable. But the same vendor that gave me the blue one also gave me the orange hat and that was totally fine! It was not the micro-hole that was in the hat but the primary oval hole was 1mm deeper then the blue one. Will it wear on the Xbox 360 hats just like what happened that started this post? Yes, yes they will! But the good news is a pack of 12 Xbox 360 hats only costs a few dollars. Versus replacement OEM Ouya hats which are impossible to acquire from the company. Saving the environment with rechargeable batteries for the Ouya controller. On a side-note I did have an alkaline battery explode in an ouya controller once! Lucky since I use it once a week or so I was able to find the problem and clean the contacts before any major corrosion were to set into the contacts. This got me thinking about getting a re-charge system going for my controllers. If you want to try NiHM rechargeable batteries which is the standard issue battery that you find at many retail stores then check this blog for warnings about Chinese batteries and what product is the best to go for. If you want to try something more exotic you can check out this hack on how to get Li-Ion batteries to work in your Ouya. Also be aware of fraud Li-Ion batteries just like the NiHM’s that exist. I have a cel-phone or tablet android system. Should I buy an Ouya Controller or stick with the Moga? I would say go with either the Moga or hook up a PS3 controller to your android. besides the issues described above it lacks a ‘start’ and ‘select’ button which tends to mess with you when you are working with emulators or even other google play related games.